Ethical Jewellery Australia is an online, bespoke handmade jewellery company and we’re pretty keen on social media. 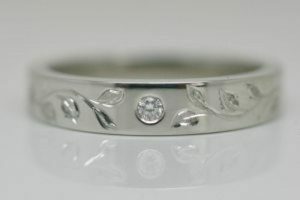 We make any kind of jewellery, but specialise in engagement and wedding rings. Every piece we make is custom made. And the finished piece is created based on a specific set of criteria – taste, lifestyle and budget. When the pieces are finished, we share pictures of them on Facebook, Instagram and Pinterest. Apart from the privacy issue, there are so many variables (particularly with diamond rings) that the question is really difficult to answer and can be misleading. A similar piece may seem out of reach when the reality is, there is often a way to tweak something to fit a (realistic) budget. Simple handmade (non-diamond) rings in palladium can start at $2000 but average around $2500 – $3000 depending on the detail. 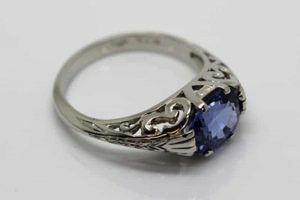 A sapphire ring in platinum with diamonds and engraving would be more like $3500+. Cognac diamond rings start at $2500 for a half carat solitaire in palladium. 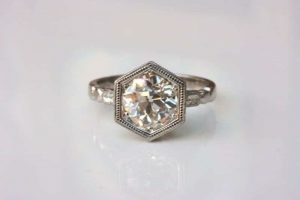 A 3/4 carat (pretty close to perfect) white diamond ring in platinum would not get much change out of $10,000 – a flawed or higher colour diamond could be a few thousand less. With a one carat diamond, it really depends on the quality. You could get one with visible inclusions for the same price as the perfect 3/4 carat, or you could go for a flawless D colour and spend $20,000+ on the diamond alone, with many price points in between. Pink diamond rings cost a great deal and even little pink diamonds are expensive. It’s impossible to give even an estimate as they vary so much. 1.36 carat white diamond in recycle platinum (handmade). Price will be $$$$+ depending on the quality of the diamond. Cognac diamonds cost less than white diamonds. 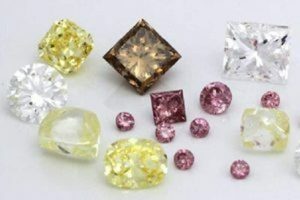 Yellow and white diamonds are similar in price. Pink diamonds are expensive – sometimes eye-wateringly so. Australian sapphires are usually less expensive than fair trade/fair made options. 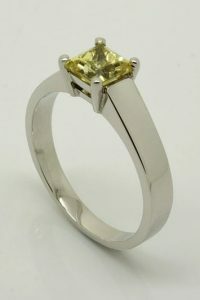 Yellow Australian sapphires are more expensive than blue, green or parti colours. White sapphires are rare and (when real) are not cheap. Good rubies cost a lot – particularly if you want a bright and fairly clean one. There are synthetic versions of many gems available at a much lower price point. Some look better than others. On top of that, design matters. A solitaire style will cost a lot less than a halo design, or one with a cut out undercarriage or lots of little diamonds etc. I told you it wasn’t an easy question to answer! Why do rings cost what they cost? *as our jewellers are also setters, we usually don’t separate manufacturing and setting – however, many jewellers outsource setting so it is often treated as a separate charge. 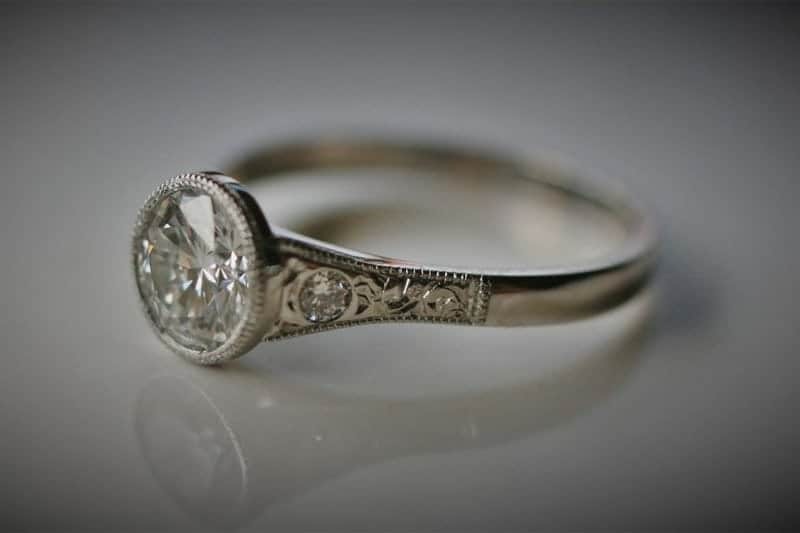 The things that most influence the cost of a ring are the type, size and quality of the main stone and the metal type. The metal type is determined by both the design of the ring and the size of the finger. Click here to learn more about choosing the right metal. The easiest way to explain metal is to use wedding ring pricing as an example. 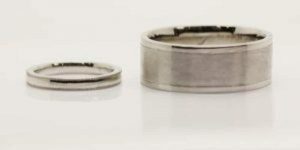 A woman with a size I or J finger looking for a 2mm platinum wedding ring is going to spend around $400 on metal, whereas a larger male with a size W finger looking for a 7mm wide ring could spend $2000 (depending on current metal price and the design, of course). On top of this, you have the cost to manufacture the ring. For the same couple, the metal cost (in platinum) would be $150 and $735 respectively (gold sits slightly below platinum). Wedding rings are really pretty straightforward, but engagement rings have so many variables – particularly if the main gem is a diamond. how big do you want the main diamond to be? what colour diamond do you want? what clarity do you want for your diamond? do you have the ring design sorted out? which metal do you want? Because the diamonds we sell are from a known origin, our pool of available diamonds can be quite limited and it isn’t always possible to match every aspect of the wish list. For some, it’s whiteness, for others, it’s size or even the values on the laboratory certificate. It isn’t like the long lists you can find online – the seemingly endless array of diamonds for sale. We work with only a handful of suppliers and stock is limited. This sort of information can’t easily be conveyed when quickly answering the ‘how much’ question. Depending on the size of the main stone, moissanite or Australian sapphire in palladium is where you will find your best ‘value’. The most predictable (price wise) options would be a solitaire moissanite or Australian blue, green or parti coloured sapphire in a simple bezel or claw setting. Pricing for the gems is standard for each shape and size – we know how long they take to make and the only variable is metal (type and quantity depending on size). If you are looking for something that is somewhat conventional, i.e. a gem in a traditional claw or bezel setting, then these are the lowest cost options. This is where the $1800 – $2500 budget comes into play. 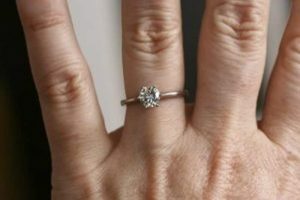 Handmade recycled palladium engagement ring. 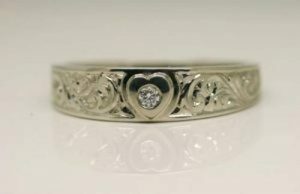 Heart feature with Argyle diamond and custom engraving. Simple and elegant, milgrain edged recycled palladium bezel set oval sapphire from North Queensland. Six claw recycled palladium and moissanite solitaire ring. 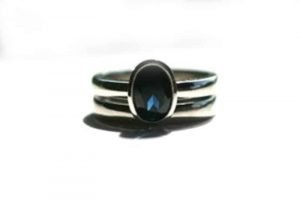 These two rings are the same basic design, similar sizes and both feature Australian blue sapphires. 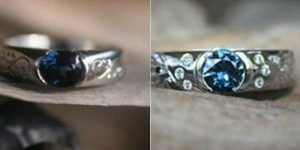 The oval sapphire ring on the left was made in recycled palladium and has very simple pattern engraving. The one on the right has a smaller round sapphire and is made in recycled platinum, has Argyle diamonds and floral engraving. In terms of price, the difference between the two was around $1400. As you can see, pricing is a very tough question to answer without clarification of many different elements. If you want bespoke, it’s good to have an open mind and work out what the most important feature is for you. That way you can ensure that you use your money wisely.